Tobacco smoking is a practice which has changed little since American natives first stuffed the tobacco they cultivated in the hills of what is today modern Mexico into hollow reeds. As the practice spread through the Americas, different cultures wrapped their tobacco in vegetable leaves or corn husks, or put it in pipes for smoking. Spanish explorers enjoyed smoking and returned to the Old World with cigars (tobacco wrapped in tobacco leaves). In the beginning of the 16th century, beggars in Seville, Spain developed the first paper-rolled cigarettes when they collected discarded cigar butts, shredded them, and rolled them in scraps of paper. Although the Spanish elite first dismissed them as recycled garbage, these cigarillos, or little cigars, eventually gained popularity during the 18th century. Cigarette smoking spread to Italy and Portugal, and eventually to the rest of Europe and into Asia. As cigarette use spread, the cultivation of tobacco gained in popularity. The Spanish, who had begun to cultivate the plant in the West Indies around 1530, soon transplanted it to their own native soil. Jean Nicot, the Portuguese ambassador to France, introduced tobacco to that country in the 1560s. The ambassador's surname later formed the basis for tobacco's botanical name, nicotiana, and the French coined the term "cigarette." In 1612, John Rolfe of Virginia began the commercial cultivation of tobacco, which became the first and most important export of the English colonies. In fact, French and English smokers soon came to prefer the mild taste of Maryland and Virginia tobacco to their homegrown varieties. At first, all cigarettes were rolled manually, whether by the individual smoker or by shop workers, who rolled and glued cigarettes before they were packaged. Baron Josef Huppmann was an integral figure in modernizing early cigarette production. He established the Ferme cigarette factory in St. Petersburg, Russia in 1850 and opened a branch in Dresden, Germany in 1872. Ten years later he also established the Monopal cigarette works in New York City. In the 1850s, Englishman Robert Peacock Gloag manufactured cigarettes with Turkish tobacco and yellow tissue paper. Gloag's method used a thin metal tube to feed crushed tobacco into a paper cylinder, forming a cigarette. In the U.S., cigarettes continued to be produced manually until the late 1800s. To make a cigarette, the worker sat in front of a table containing a small trench the length of a cigarette. The rolling paper was placed in the trench so its edges were slightly above the tabletop, and a pinch of shredded tobacco was placed in the paper. The worker, wearing a piece of felt over the palm of the hand, rubbed the felt over the trench until it caught an edge of the paper. Continuing the motion, the worker rolled the cigarette into shape and sealed it with paste. A good roller could make almost 40 cigarettes per minute using this method. In 1880, James A. Bonsack was granted a U.S. patent for a cigarette machine that uniformly fed tobacco onto a continuous strip of paper. It mechanically formed, pasted, closed, and cut cigarettes with a rotary blade. Six years later this machine was refined by William O'Brien and James B. Duke, and it produced 4,000,000 cigarettes per day and reduced costs by 50 cents per every 1,000 made. During the World War I era, the longstanding popular bias against female smokers began to diminish, providing a new market for the tobacco companies. Packaging machines were developed during the early 1900s, and, in 1931, moisture-proof cellophane that preserved the freshness of the cigarettes was introduced. Also in the 1930s, seed flax, an herb commonly cultivated in the U.S., was discovered to be a viable new source of cigarette paper. This discovery and the erection of a cigarette paper plant in North Carolina enabled the U.S. cigarette industry to flourish after the end of World War II. As the popularity of cigarette smoking increased in U.S., the federal government and private agencies began to investigate the hazards of smoking. Tar, a residue present in tobacco smoke, was found to contain at least a dozen carcinogens. When cigarette smoke is drawn into the mouth, throat, and lungs, the tar condenses to form brownish deposits on the walls of the airways. Nicotine is a toxic alkaloid that is both narcotic and addictive. It occurs naturally in tobacco, although the percentage varies depending on the growing conditions and curing methods. The nicotine contained in tobacco first stimulates and later depresses the central nervous system. It also increases heart rate, blood pressure, and the heart's need for oxygen. In 1964, the federal government published its first report on smoking and human health. The latest studies released by the Surgeon General and the Environmental Protection Agency (EPA) state that cigarette smoking increases the incidence of heart disease, cancer of the larynx, esophagus, and mouth, and birth defects in pregnant women. They also detail the newly studied effects on female smokers and the carcinogenic properties of secondhand smoke. This 1914 pamphht collected testimony opposing smoking by boy$. In 1914 Henry Ford outraged the tobacco industry by publishing a widely publicized booklet condemning smoking. 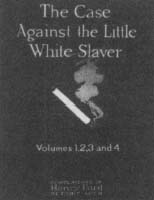 The pamphlet, entitled The Cam Against the Little White Slaver, contained testimonials from doctors, Sawyers, ministers, and employers, among others, on the delitrious effects of smoking. Ford prefaced his attack on cigarettes by soliciting a letter from Thomas Edison that read: "The injurious agent in cigarettes comes principally from the burning paper wrapper. The substance thereby formed is called 'acrolein.' It has a violent action on the nerve centers, producing degeneration of the cells of the brain, which is quite rapid among bays. Unlike most narcotics, this degeneration is permanent and uncontrollable, I employ no person who smolces cigarettes,"
For ford, as for many of the others, cigarettes posed more of a moral threat than o physical one. Ford aimed his attack at young boys, hoping to dissuade them from taking up the habit. He wrote of cigarette smokers canin saloons and pool halls, and linked smoking to criminal activoduced testimony from university presidents that smokers seldom excelled in academics. The most important component of cigarettes is tobacco, which graos in two varieties: Nicotiana tabacum, or cultivated tobacco, and Nicotiana rusica, or wild tobacco. Although transplanfing machines are available, the vast malority of the world's tobacco plants are still planted by hand. alternative cigarettes, including menthol, filter-tipped, and low-tar cigarettes. Menthol cigarettes smell and taste "cooler" because they are flavored with a substance found in mint oil, although they pose the same health risks. Filters help block some materials from entering the body, but their effectiveness varies from brand to brand, and even low-tar cigarettes expose the body to potentially harmful levels of tar. Recently, manufacturers have sought to reduce the amount of nicotine in cigarettes as well. The most important component of cigarettes is tobacco, which grows in two varieties: Nicotiana tabacum, or cultivated tobacco, and Nicotiana rustica, or wild tobacco. Native to the western hemisphere, the plant is now widely grown in countries such as China, India, Brazil, the former Soviet Union, Turkey, and the U.S. About one third of the tobacco cultivated in the U.S. is exported. North Carolina is the leading domestic grower, followed by Kentucky, South Carolina, Tennessee; Virginia, and Georgia, all of which have favorable soil and climates for tobacco growing. The plant does best in light and sandy loam soils that drain well and permit good aeration. The tobacco plant requires a frost-free growing season of 100-130 days; thus, it tends to be cultivated within 50 degrees latitude of the equator. Cigarette rolling papers use seed flax mixed with paper pulp to produce a thin, flammable paper. The filters are made of synthetic, cotton-like fibers that catch particles as they are drawn through the length of the cigarette. The finished cigarettes are packaged in hard or soft cardboard boxes and wrapped in protective cellophane. 1 Tobacco is initially grown in outdoor frames called seedbeds. In warm regions, the frames are covered with mulch or a cotton top sheet; in cooler regions, glass or plastic shields are installed to protect the plants. After 8-10 weeks, when the seedlings are almost 10 inches (25 cm) tall, they are transplanted to the fields. Although transplanting machines are available, the vast majority of the world's tobacco plants are still planted manually. As the plants grow, the heads are broken off by hand so the leaves will grow fuller, a process called topping. The plants stay in the field 90-120 days before they are harvested. wilt in the field before being taken to the curing barn. 3 Next, the leaves are carefully, gradually dried in a specially constructed barn by air curing, flue curing, or fire curing. Air curing uses natural weather conditions to dry tobacco. Stalks are hung in a barn with ventilators that can be opened and closed to control temperature and humidity. Artificial heat is used only during cold or excessively humid weather. The stalks are hung for four to eight weeks. 4 Flue curing is done in small, tightly constructed barns that are artificially heated. The heat comes from flues (metal pipes) that are attached to furnaces. Open oil and gas burners are sometimes used, but this method is problematic because smoke can-not come in direct contact with the tobacco. Flue curing takes about four to six days. 5 Fire curing dries tobacco with low-burning wood fires whose smoke comes in direct contact with the leaves, thus producing a smoky flavor and aroma. The tobacco is allowed to dry naturally in the barn for three to five days before it is fire-dried for 3-40 days. 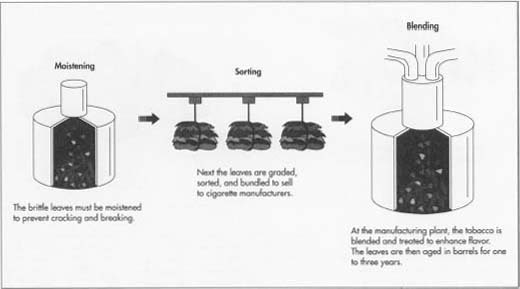 6 Unless humid weather conditions eliminate the need, the brittle, cured tobacco leaves must be conditioned in moistening chambers so they do not break when they are handled. After moistening, the tobacco is stripped. During this process, the leaves are sprayed with additional moisture as a precaution against cracking or breaking. 7 After the leaves are moistened and stripped, they are sorted into grades based on size, color, and quality, and tied in bundles for shipment. The farmers then bring the tobacco to warehouses, where it is placed in baskets, weighed, graded once again by a government inspector and, finally, auctioned to cigarette manufacturers. redries the tobacco. This involves completely drying the leaves by air and then adding a uniform amount of moisture. Packed into barrels called hogsheads, the tobacco is then aged for one to three years, during which period it develops its flavor and aroma. After it is aged, the tobacco leaves are again moistened and the stalks and other wastes removed. Leaves from different types of tobacco are mixed to create a particular flavor. 9 After blending, the tobacco leaves are pressed into cakes and mechanically shredded. Materials such as fruit juices or menthol are added to give additional flavor. The final shredded tobacco is then dispersed over a continuous roll of cigarette paper. A machine rolls the shredded tobacco into the paper and cuts it to the desired length. A device then grabs each cigarette and fastens a filter in one end. Modern cigarette machines can produce 25-30 cigarettes a second. 10 The final stage of cigarette manufacture is packaging. The completed cigarettes are packed 20 to a package. The hard or soft packs are mechanically sealed in cellophane and hand-placed in cartons. As more and more evidence suggests that cigarette smoking harms both smokers and those around them, efforts to limit smoking in the U.S. have intensified. The federal government continues to take an active role in smoking and public health. Recent Surgeons General have all publicly opposed the practice as an unnecessary health risk. Numerous studies into the effects of smoking have been funded, and government-sponsored public service announcements are being aired and printed. Many such announcements are tailored towards children, as are many anti-smoking school and public health programs. To raise revenues and discourage younger smokers, several states have approved large cigarette taxes. Employers have also banned smoking within their buildings to curb secondhand smoke. Though the market for tobacco products has eroded significantly since the U.S. government began publishing reports on the dangers of cigarette smoking, smoking is still common among Americans. Although a smaller percentage of American men smoke today than thirty years ago, a greater percentage of smokers are women and teenagers. Large cigarette manufacturers have also been cultivating markets in developing nations, particularly the Far East. Grise, Vernier. The U.S. Tobacco Industry. U.S. Department of Agriculture Economics Research Service, 1988. Colford, Steven W. "What High Court Ruling Means for Cigarette Ads." Advertising Age, June 29, 1992. Mallory, Maria. "For Reynolds, Where There's Smokeless.…" Business Week, March 27, 1995, p. 39. Manning, Anita. "Smoke Report May Change Public Habits." USA Today, January 7, 1993, p. A-i. Marwick, Charles. "Advocates Say Smoke-Free Eventually May Result from More Curbs, Taxes on Tobacco Use." JAMA, February 10, 1993, p. 724. "Tobacco Industry Fights Anti-Smoking Tax Plan." New York Times, October 25, 1992, pp. 1-21. I INVENTED A NEW TYPE OF SMART CIGARETTES.FOR SMOKING harm reduction-cessation. IT IS NOW PAT.PEN. WORLDWIDE. Can anybody help me l need cigarette filter raw material where from I can get. Please mail me in details.